1837 - Michigan becomes the 26th state in the union. 1847 - Lansing, then known as Michigan, becomes the capital of Michigan. 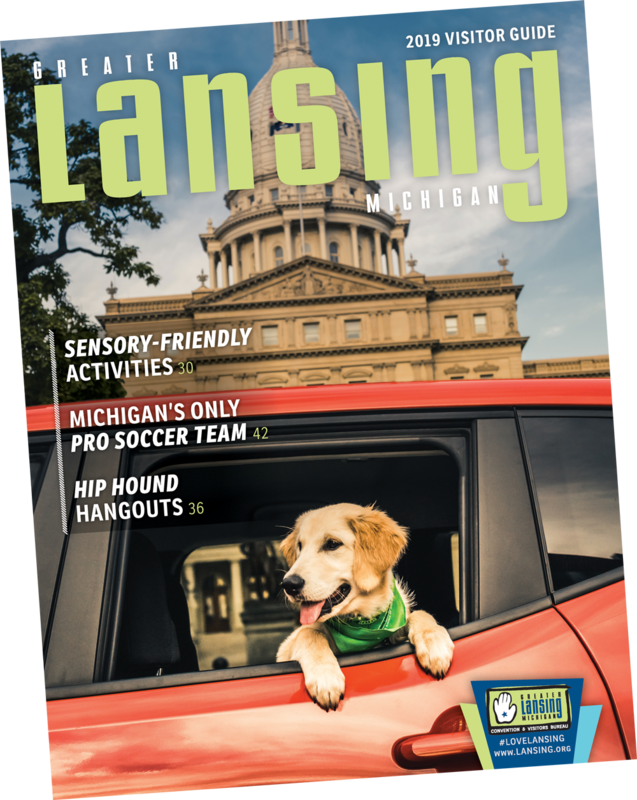 1848 - Michigan, Michigan is renamed Lansing by the Michigan Legislature. The name is derived from Lansing, Michigan, a town in New York named for John Lansing Jr., a significant New York statesman. 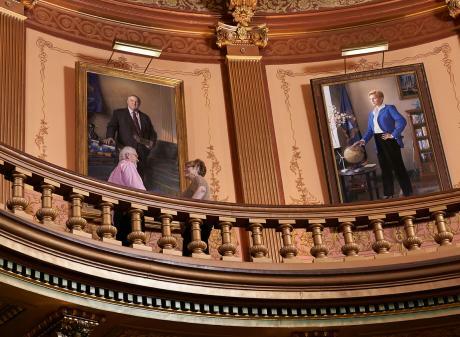 Also, the Michigan Legislature meets in Lansing for the first time. 1855 - Michigan State University is founded as the Agricultural College of the State of Michigan, becoming the first land grant university in the United States. Also, the Industrial School for Boys, also known as the Boys Reform School, is created by the legislature. 1859 - Lansing is incorporated as a city. 1872 - Construction of the new Michigan State Capitol begins. 1874 - The new Lansing High School - later known as Old Central - opens. 1879 - The new Michigan State Capitol Building is dedicated in Lansing; the structure cost $1,510,130. 1880 - The Michigan School for the Blind opens in north Lansing. 1882 - The old wooden Capitol burns. 1896 - A group of local women form the Women's Hospital Association, the organization that will go on to found Sparrow Hospital. 1897 - The Olds Motor Company is formed in Lansing. 1904 - Lansing's Carnegie Library opens. Today the library building is a part of Lansing Community College. 1905 - The REO Motor Car Company is established in Lansing by Ransom Olds. 1907 - East Lansing is incorporated as a city. 1912 - Sparrow Hospital opens. 1928 - Eastern High School opens. 1934 - The Kern's Hotel in downtown Lansing burns. It remains Lansing's deadliest fire. 1937 - Pope Pius XI forms the Lansing Catholic Diocese. Also, the Knapp's Department Store opens their new building in downtown Lansing. 1943 - Lansing Sexton High School opens. The Spartan Sculpture on MSU's campus is dedicated. 1951 - The Michigan State Football team wins the national championship. 1952 - The Michigan State Football team wins the national championship. 1955 - The Michigan State Football team wins the national championship. 1957 - Lansing Community College is founded. Also, the Michigan State Football team wins another national championship. 1959 - The present Lansing City Hall opens as a part of Lansing's centennial celebrations. 1960 - Lansing's population tops 100,000 for the first time. 1965 - The Michigan State Football team wins the national championship. 1966 - The Michigan State Football team wins another national championship. 1969 - The current Lansing Everett High School opens. 1972 - The Thomas M. Cooley Law School is founded. 1979 - The Michigan State men's basketball team, led by local Lansing athlete Earvin "Magic" Johnson, wins the NCAA Championship. 1983 - The annual Celebration of Michigan Women, at which historic and contemporary women are inducted into the Michigan Women's Hall of Fame, is founded by the Michigan Women's Studies Association. 1985 - Martha M. Mertz of Okemos founds the ATHENA Award Program to honor outstanding business and professional women for their achievements, community service and assistance to other women in gaining leadership skills; the program becomes national in 1985 and international in 1994. 1987 - On January 26, Michigan celebrates 150 years of statehood. 1989 - The Michigan Library and Historical Center is dedicated in Lansing. 1992 - The State Capitol Building is fully restored and rededicated. 1992 - Merrily Dean Baker of Okemos is the first woman to be the Athletic Director at a Big Ten University, at Michigan State University. 1994 - The first on-campus domestic violence shelter in the country is founded at Michigan State University by Joanne McPherson of East Lansing. 1996 - The Lansing Lugnuts minor league baseball team begins playing in Lansing. 2000 - The Michigan State men's basketball team wins the NCAA Championship. 2001 - GM opens the Lansing Grand River Assembly plant, which builds the Cadillac CTS, STS, SRX and V-Series. The architecture of the assembly plant resembles a high-tech research facility instead of a traditional factory. 2002 - Michigan elects its first female governor, Jennifer Granholm (D). 2004 - The last Oldsmobile is made in Lansing. 2006 - GM opens a state-of-the-art facility in nearby Delta Charter Township. As with the 2001 assembly plant built in Lansing, the Delta plant resembles a high-tech research facility and not a traditional factory. 2009 - Lansing celebrates its Sesquicentennial (150 years).